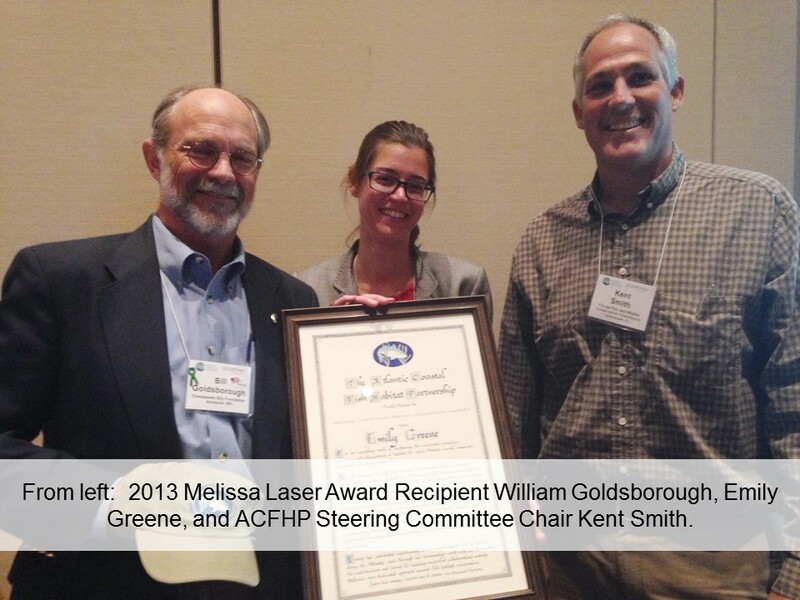 Ms. Emily Greene was presented the 2014 Melissa Laser Fish Habitat Conservation Award by the Atlantic Coastal Fish Habitat Partnership (ACFHP) for her exemplary work in furthering the conservation, protection, restoration, and enhancement of habitat for native Atlantic coastal, estuarine-dependent, and diadromous fishes. The award was presented at the 7th National Summit on Coastal and Estuarine Restoration in National Harbor, Maryland on Wednesday, November 5th. Emily was ACFHP’s first Coordinator and is currently working at the National Oceanic and Atmospheric Administration as the Marine Habitat Program Outreach Specialist. As Coordinator, Emily worked tirelessly to guide the Partnership and Steering Committee in developing its reputation as a successful fish habitat conservation and restoration organization. Her personality and enthusiasm have been major factors in guiding the Partnership to where it is today. She was integral in managing the Steering Committee, establishing the operational framework for the Partnership, and developing the first Conservation Strategic Plan. She was also responsible for collaborating with federal partners to secure funding for restoration projects, coordinating the development of multiple scientific products, securing operational funding, and disseminating information via numerous outreach opportunities. The award is established in memory of Dr. Melissa Laser, who was a biologist with the Maine Department of Marine Resources, where she worked tirelessly to protect, improve and restore aquatic ecosystems in Maine and along the entire Atlantic Coast. Dr. Laser brought her smiling dedication and enthusiasm to the Atlantic States Marine Fisheries Commission’s Habitat Committee and Atlantic Coastal Fish Habitat Partnership’s Steering Committee, catalyzed by the Commission in 2006. Her contributions to these committees and to her home state were tremendous.Emily’s contributions and talent for building successful collaborations embody Melissa’s own dedicated approach towards fish habitat conservation. For additional information, please contact Lisa Havel, Atlantic Coastal Fish Habitat Partnership Coordinator, at 703.842.0740 or lhavel@asmfc.org.